Diabetic people may be putting their sight at risk by not having a certain type of eye test, a charity has warned. According to Diabetes UK, 26 per cent of diabetic adults in the UK did not have their retinas screened with a digital camera during the course of last year. 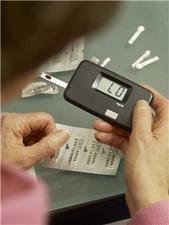 This means that about 500,000 diabetics could be putting their vision in danger. A retinal screening with the digital camera checks for retinopathy, a condition affecting blood vessels in the retina. Diabetic retinopathy is the greatest cause for working age people in the UK losing their sight. There are more than 170,000 members of Diabetes UK and the organisation works not only with diabetic people but also their relatives, friends and carers.